Please check the "Events Calendar" for last minute updates. Jump on board the Park to Park Shuttle Bus to get a quick, FREE ride between the two parks. The Park Shuttle Bus departs from the Cama Beach Store headed for Camano Island State Park. at Camano Island State Park. 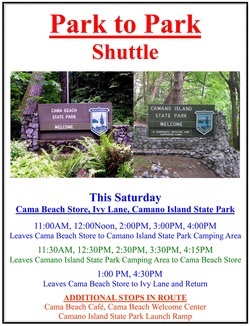 The Park Shuttle Bus departs from the camping area at Camano Island State Park bound for the Cama Beach Store. Stops along the way include the boat launch at Camano Island State Park, the Cama Beach Welcome Center, and the Cama Beach Cafe. The Park Shuttle Bus starts at the Cama Beach Store and travels to Ivy Lane trailhead.